There are a few quintessential elements for a satiating lifestyle pivoting around a recreational vehicle. An RV dishwasher is not always deemed to be a must-have item, but it is a significant time saver and is something you might want to seriously consider purchasing, at the very least for the convenience factor. Some people never really cook and prefer using disposable plates, cups, glasses, and cutlery. If you do not intend to use dishes, pots, and pans, then you should not buy an RV dishwasher. The installation will add to the weight of your vehicle. It is also futile to have an appliance that you will never or rarely use. However, most people consider the kitchen in a recreational vehicle to be incomplete without a dishwasher. RV dishwashers are lighter and portable than the standard models used in residential kitchens. There is no dearth of brands or variants so you will not be tied down to a couple of options. An RV dishwasher is not a miniature or basic version of state of the art dishwasher. You will find multiple place settings and enough capacity for a single load. There are models that can easily accommodate plates that are as much as eleven inches wide. RV dishwashers are sturdy and durable appliances. However, you should be conscious of the fact that the water can quite hot, at times well over a hundred and fifty degrees, so exercise caution. The usual detergents used in such dishwashers are also quite powerful. Before you delve into the specifications, advanced features and the prices of different models of dishwashers made by all major and lesser-known brands, you should have a comprehensive understanding of your needs as they may be quite common or rather distinct. The size of the kitchen and the countertop in your recreational vehicle, the frequency of use, the load you must take care of and other factors must be weighed in even before you set out to compare different models. An RV dishwasher needs a water source and power. A countertop model may need around three to four gallons of water for a single full load. A more compact dishwasher may consume up to twelve gallons of water. A relatively small dishwasher will need a power of around twelve hundred and fifty watts through a standard hundred and twenty volts source. An RV dishwasher should be quieter than one you may have at your home, especially if you are exploring remote places and do not want the noise to affect the ambiance. You must check the noise ratings for the dishwashers during a holistic comparison. Some dishwashers have hot air or steam issues so you have to ensure the exhaust fan is turned on before you start operating the appliance. You must also remember to winterize the RV dishwasher. The appliance has pumps and uses hot water so it will have to be prepped to deal with freezing temperatures. Many people travel far into the wilderness and often tread up north to places where the mercury can dip dramatically in the evening and remain at uncomfortable lows through the night. You do not want a crisis when you are on the move. Winterize the dishwasher. Portable countertop dishwashers can be uninstalled or simply removed and you can use it indoors if you want. You will definitely want a compact but efficient RV dishwasher. It should be compatible with your recreational vehicle. If you have an old one, then look for an appliance that can be a suitable retrofit. There are several prerequisites you need to consider before you choose a suitable model. Consider how frequently you will use the appliance, whether or not you will wash pans and pots, if you need multiple place settings, how much counter space you can allot and the kind of water you can provide, if you need the plates to air dry or you want to use heat and if you will be cleaning glassware and China. There are three types of RV dishwasher. One is countertop and another is compact. The third type is dishwasher drawer. It is quite popular among owners of recreational vehicle. None of these variants or types is a natural fit for all vehicles. They have their advantages and disadvantages. You must choose one that satiates your needs and delivers a performance that you will be content with. A countertop RV dishwasher is simple and quite easy to use. It can be installed anywhere on the counter as long as it is possible to connect it to a water source. Connecting it to a power source is easier. Most people prefer to install this variant next to the sink. It gets easier to connect to the water source and drainage also becomes simpler. Countertop variants are not expensive and professional installation is not necessary. Typical countertop dishwashers are as large as a big microwave. A countertop RV dishwasher can take up substantial space on the counter. Recreational vehicles have compact counters. Some smaller models have very little counter space. Countertop models are also heavier than other variants so they will add some considerable weight. The weight and size make these a little hard to quickly move around and you may not be able to store it anywhere in the vehicle when you do not intend to use it. Many people do not have a storage plan. Do not make this mistake. A compact or slimline RV dishwasher takes much less space. They are noticeably quieter. You can remove a cabinet or drawer from the kitchen in your recreational vehicle to install this appliance. A typical model requires just eighteen inches of space. These models are not absolutely basic as you can get multiple place settings. One common problem of such models is water consumption. You will also need the appliance to be plumbed and wired into your vehicle. This is a built-in model so it will need to have a discharge and must be connected to the grey tank. The variant also needs professional installation. RV dishwasher drawer does not need much space. It is a rather cool and trendy appliance. It is more popular among owners of high-end recreational vehicles. Many brands now offer both countertop and drawer models. An RV dishwasher drawer will not consume over four gallons of water. These models can wash and dry. Typically, you can get as many as six place settings. An RV dishwasher drawer needs professional installation. Not every recreational vehicle will find this option to be appropriate if the connections are not there. You should ensure that your recreational vehicle will be able to host this appliance, primarily with regards to space and connections. You should have a checklist including sources of water and power, drainage and possible discharge into the grey tank. You should have a storage plan. Unless you take good care and are always alert, you may have a frozen dishwasher during winter if there is leftover or residual water inside. You can buy an RV dishwasher online or offline. The best place to shop for such an appliance is Amazon. You will get access to all major brands and some of the companies you may not know of but which are just as good as the more popular manufacturers. You will also get to read what fellow recreational vehicle owners have to say about the various models. EdgeStar has more than one type or variant of RV dishwasher. 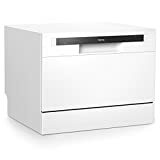 The DWP62SV model is a countertop dishwasher with six place settings. The Energy Star rated dishwasher is portable and comes in three colors: silver, black and white. 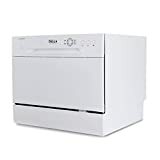 It is presently one of the highest rated RV dishwashers on Amazon. The six place settings include a rack for dishes, a shelf for cups and a basket for cutlery. You can wash plates as big as ten and a half inches in diameter. The RV dishwasher is around seventeen inches high, twenty-two inches wide and twenty inches deep. There are seven wash cycles. The adapter is compatible with standard faucets. There is a digital display, the interior is of stainless steel, the design makes it suitable for most cabinets and water consumption for a normal wash is just short of three gallons. The EdgeStar model runs on 1160 W or 10.7 A power with an input voltage of 120 V or 60 Hz. It has a noise level of 52.3dB. There is a warranty on parts valid for a year and on labor for ninety days. DELLA has a portable and compact countertop dishwasher for recreational vehicles and small kitchens at homes. The model comes in black and silver. It has six place settings and a basket for silverware. The appliance is capable of reliable and effective performance. The interior is of stainless steel, there is a powerful spray arm and the model is heat proof for up to a hundred and forty-eight degrees. Della markets the product is compatible with small and compact kitchens in houses or apartments, boats or yachts, and recreational vehicles. The appliance is easy to use. Filling it up with detergent and the rinse aid dispensers are easy operations. There is an LED display highlighting the cycle and its progress. There is a signal when the cycle ends. There is a control panel with light indicators for power, start and end of the program, a selector for programs and wash cycles, buttons for start or pause and delay, an indicator for water faucet and warning light for rinse aid. We found a deal on Della here. HOmeLabs has a portable and compact RV dishwasher. It is actually a mini RV dishwasher, also suitable for small homes and offices. The model comes with stainless steel interior and six place settings including a rack and basket for silverware. The countertop model takes little space and looks rather sleek. It comes in white only as of now. 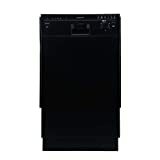 The light dishwasher comes with light indicators and a control panel providing a program selector, as many as six wash cycles to choose from and a delay option. The six wash cycles are normal, heavy, glass, speed, eco and rinse. This RV dishwasher comes with the accessories needed to set it up. You do not need any tools to install the appliance. The box includes inlet and drain hose, faucet adapter and removable aerators. It has a rinse aid dispenser to dry glass, mugs, and plates without streaks or marks. There is an indicator to alert you when you must refill the dispenser. The mini dishwasher is only seventeen inches by just short of twenty inches by twenty-two inches. We found a deal on HOmeLabs. EdgeStar has a BIDW1801BL model which is more suited for those who use larger plates. The Energy Star rated RV dishwasher is eighteen inches wide, twenty-two inches deep and almost thirty-three inches high. It has eight place settings and comes in black or stainless steel color. There are a cup tray and silverware basket. There are two dish racks that can be pulled out. There are six wash cycles including normal, heavy, light, speed, glass and rinse. The appliance has light indicators and produces buzzer sounds at the end of a wash cycle. Furrion makes a compact RV dishwasher made of stainless steel. The FDW18SAS-SS model is durable. It has electronic controls that can be operated with a light touch. All these controls are integrated. The interior is of stainless steel, so is the front that makes the appliance look quite posh. There are sturdy racks making loading efficient and the dishes are secured. There is a wash cycle for glasses. The model is quite effective at handling glassware, even when it accounts for the full load. There are other brands and models of RV dishwasher, on Amazon and elsewhere. You can compare as many as you want to find the most suitable variant.